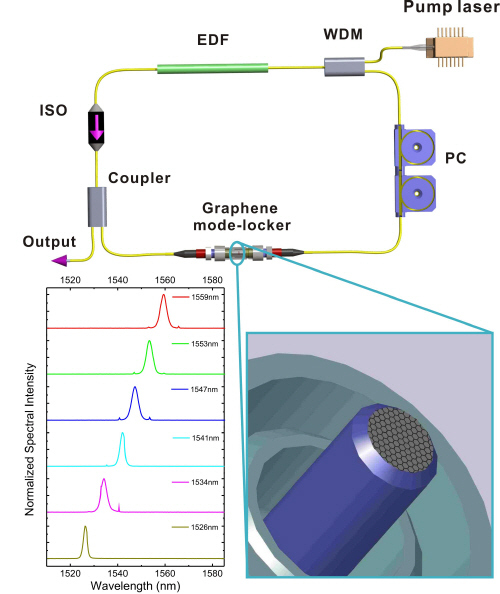 Researchers at the University of Cambridge in the UK and CNRS in Grenoble, France, have fabricated an ultrafast "mode-locked" graphene laser. The result – which comes as quite a surprise, given the absence of a band gap in graphene – paves the way to photonic devices based on the material. Since its discovery in 2004, graphene has continued to amaze scientists thanks to its unique electronic and mechanical properties that make it useful for a host of device applications. The "wonder material", as it is called, might even replace silicon as the electronic material of choice in the future. Graphene consists of a planar single sheet of carbon arranged in a honeycombed lattice and electrons travel through the material at extremely high speeds thanks to the fact that they behave like relativistic, or "Dirac", particles with no rest mass. Now, Andrea Ferrari and colleagues say that graphene might be used in optoelectronics applications too, by demonstrating an ultrafast laser made from the material. Ultrafast lasers are widely used in science and technology, and there is an increasing demand for compact, tunable laser sources. Today, the dominating technology in so-called mode-locked lasers – that is, lasers that produce ultrashort pulses at a very high repetition rate – is based on semiconductor saturable absorber mirrors (SESAMs). However, such devices are complicated and expensive to make, and are severely limited in their bandwidth. The new ultrafast laser exploits graphene and graphene layers as mode-lockers. "In principle, this is quite a surprising result because graphene has no band gap, which is a key requirement for mode-locking in SESAMs," said Ferrari. The team studied how light is absorbed in graphene and how photo-excited charge carriers behave in the material. In particular, they highlighted the key role of "Pauli blocking" in saturating the light absorption. Because of the Pauli exclusion principle, when pumping of electrons in the excited state is quicker than the rate at which they relax, the absorption saturates. This is because no more electrons can be excited until there is "space" available for them in the excited state. Since the Dirac electrons in graphene linearly disperse, this means that it is the most wideband saturable light absorber ever, far out-passing the bandwidth provided by any other known material. The researchers made their laser by starting with a graphene-polymer composite, obtained from a solution of graphene. Next, they placed this composite between two optical fibres in a laser cavity. "Graphene is the ideal wideband saturable absorber, able to operate from the UV to visible and far-infrared wavelengths," Ferrari told nanotechweb.org. "Our graphene-based ultrafast laser, which harnesses the wideband optical nonlinearity of graphene, with no need for band gap engineering, extends the practical application of this novel material from nanoelectronics to optoelectronics and integrated photonics." 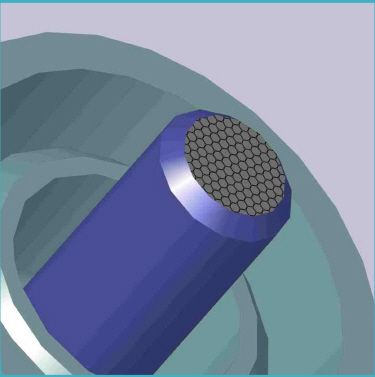 The team are now in the process of optimizing a fully functioning wideband tunable laser based on graphene, as well as trying similar experiments with graphene oxide.